Though few associate apples with India, the country’s incredible geographic diversity enables certain states to grow delicious apple varieties. To track the history of apples is to track the history of mankind. While most historians speculate that it wasn’t the apple responsible for man’s downfall in the Garden of Eden--the culprit is more likely a pomegranate--apples still receive mention in humanity’s earliest recordings. Indeed, Europeans grew apple trees as far back as the stone ages. The precise origin of the fruit gets bantered around between botanists: Some claim it’s Switzerland or Scandinavia, but others more credibly point to the Caucus regions, specifically Kazakhstan. Another theory is that apples came from the ancient supercontinent of Laurasia. When it split, North Americans had sour crab apple varieties, whereas Central Asians were blessed with the larger, sweeter varieties. Apples have been in India for centuries. Although the British like to credit their introduction to India during their rule, the nation had the fruit much before then—N. Jayapalan writes in his book, “Economic History of India” that the Muslim ruler Firoz Tughlaq grew apple trees throughout Delhi neighborhoods during his life from 1309 to 1388. When the British came centuries later and planted apple trees in the north, their reception amongst the locals was poor on account of their sour crabapple taste. It was only when Samuel Evans Stokes of Philadelphia came to India in the early 1900s—bringing with him several seeds from sweet apple variants—that the farmers of Himachal Pradesh took note and the country’s apple industry exploded. Apples need cold weather and crisp, chilly air to thrive. The regions best suited for these conditions are in the north, and apples grown in Kashmir are of particularly high quality. In 2011-2012, approximately 80 percent of India’s apple production originated from Jammu and Kashmir, with the region growing nearly 1.8 million tons. Himachal Pradesh is the second largest producer, accounting for 12.5% percent of India’s production at 275,000 tons. 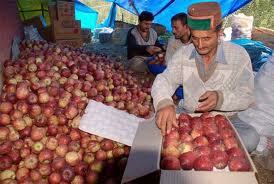 Trailing at a distant third, Uttarkhand grows 5% percent of India’s apples. Other states producing a negligible amount of the country’s supply are Uttar Pradesh, Arunachal Pradesh, Uttaranchal, Sikkim, Nagaland, and the colder hill stations of Tamil Nadu. Consumers can find apples year-round, partly because India imports fruits during the off-season. To meet the nation’s ever-growing demand, India imports fruits from the US, China, Chile, New Zealand, and Italy. Though apples may not be strongly associated with India, 2011 production figures published by the UN’s Food and Agriculture Organization reveal that India as the third largest growers of apples in the world, accounting for nearly 4 percent of the global output. India’s production, however, comes nowhere near China’s: This country produces almost half of the world’s apple supply. Red delicious: a mid-season apple grown in Himachal Pradesh. This variant, along with Royal Delicious, are the most widely grown types in India. Golden delicious: a late-season cultivar gown in Jammu and Kashmir, and Himachal Pradesh. McIntosh: A reddish pink apple with a golden blush grown in Uttar Pradesh and Himachal Pradesh. Lal Ambri: A reddish yellow apple grown in Jammu and Kashmir. India’s peak apple season is August through September. However, some varieties from Uttaranchal appear during the late summer months, and the Jammu and Kashmir’s apple season may stretch into late November. During the fall, apples can be found everywhere from small pushcarts to gourmet grocery stores. Expect erratic prices—apple supply depends greatly on the monsoon season’s rainfall, which is seldom predictable. Once the fall season ends, those willing to pay a premium may find imported apples at higher-end shops. These apples tend to be mealier and of low quality, likely because of the extensive shipping distances, early plucking and consequently, the ethylene gassing required to keep the fruits from perishing. Ripeness depends on the type of apple, but none should be mushy or give to the touch. Also avoid noticeably bruised or cut fruits. The ideal apple has a smooth, tight skin. Though blemish-free apples may seem desirable, it’s worth noting that delicious organic apples tend to have thicker russeted skin. Some of the smallest, most dense apples may be significantly more flavorful than the shiny “perfect”-looking fruits. Apples grown locally have a delightfully sweet, floral smell that sadly vanishes when shipped long distances or are plucked prematurely. Though it’s not a pre-requisite, grab such fruits if available. Similar to a baseball, crisp fruits also feel somewhat light, but have a bit of heft when lifted with the hand. Flick an apple gently and listen—it should sound hollow. Commercially grown apples are sweet, juicy and have a pleasing grainy texture quite similar to drier pear varieties. The particular balance of sweetness, granularity in texture and robustness in flavor depends on the variety, but as a loose rule of thumb, fall in 4 major categories: green, pink, gold, and red. Green: Should be crisp, firm and have a good crunch to it; the taste is a mix of sweet, acidic and sour. Green apples have a pungent sour “bite” not found in other commercial varieties, but often bears resemblance to the flavor found in wild apples. These are best raw or baked. Pink apple varieties: The texture should be crisp, firm and predominantly sweet with a slight hint of acidity. Pink apples have some of the sour notes of green apples, but are often much more agreeable in their sweetness. These are best raw, chopped in salads, and in the case gala apples, slow baking. Golden apple varieties: Look for a softer texture with a mild but sweet flavor. It is juicy, crisp, and versatile, ideal for use in pies, salads, and applesauce. Red apple variety: Usually not as crisp or firm as the other varieties. The texture is grainy and the flesh is not as tightly packed. Red apples are often the sweetest tasting of the three and the least acidic. Along with golden apples, red apples have the mellowest flavor. *Note: some varieties within each of these categories may deviate from the standard profiles outlines above. Apples have a number of traditional uses, as well as scientifically validated health benefits. According to the “Encyclopedia of Folk Medicine,” the British used to rub apples on warts. Unsurprisingly, given the fruit’s high fiber content, it’s a long-standing remedy for constipation and other stomach ailments. Rotten apples once treated topical ailments like sore eyes, weak eyes, unsightly stys, sores and blisters. In Cambridgeshire, the belief was that leaving an in the room of a smallpox patient would transfer the debilitating illness from the patient to the fruit. Even today, the applications of apple cider vinegar are worthy of its own encyclopedia. --A 2007 study published in the “Journal of Agricultural and Food Chemistry” found that compounds in the apple peel have potent anticancer activities when tested on human breast cancer cells, liver cancer cells, and colon cancer cells. --A 2011 study also published in the “Journal of Agricultural and Food Chemistry” indicates that the lifespan of the apple-eating test animal group increased ten percent. These animals also had fewer signs of age-related illnesses. --A Florida University study conducted by Dr. Bahram Arjmadi illustrated that the group of women who consumed apples regularly for 6 months experienced a staggering 23 percent decrease in LDL cholesterol levels. Though this group consumed, on average, 240 calories more than the control group, they still lost 3.3 pounds. --A 2011 study published in the “Journal of Leukocyte Biology” found that apples contain an anti-inflammatory compound that can suppress T-cell activation, thus holding promise for sufferers of bowel inflammatory disorders such as Chron’s disease, ulcerative colitis, and possibly colon cancer. --A 2012 study published in “Food Chemistry” indicates that compounds in apple peel display antihypertensive properties, which may remedy high blood pressure. To de-core an apple, cut the fruit into quarters and slice away the seeded, fibrous core from each piece. Some tools are also available, like this one: you simply center the tool on top of the apple, and then press down: you then have a de-cored apple with evenly-sized slices. Several reports suggest peeling the skin from any apple purchased in India. Though the skin is one of the most nutritious parts of the fruit, a “Times of India” article reports that apples have the highest levels of Parkinson’s-linked pesticides. Additionally, dirt and auto exhaust residue frequently coat apples while in transport and from sitting in the market. If removing the skin is undesirable for whatever reason, thoroughly scrub and sanitize the apple before consumption. Apples will not continue to ripen once picked from the tree, and will instead spoil slowly over time. Do not keep apples near bananas or potatoes, as the ethylene gas will accelerate the apple’s spoilage. Even bruised apples may hasten the spoilage of other the other fruits. Unless one’s pantry is cool and dry, then transfer apples to the fridge immediately. The refrigerator offers apples a much better environment than a warm, humid basket in the kitchen. In crisp, dry conditions, apples will keep for three weeks. Pink and green apples have a longer lifespan than golden and red varieties. Do not freeze apples. When the temperature drops below 32F, cells in the apple burst and subsequently, destroys the texture and taste of the fruit. --Fresh apple juice is one of the simplest recipes. The fruit pairs well with cucumber, watermelon and carrot. The juice from dark, bitter greens like spinach and kale become more palatable with green apples thrown into the juicer. Apples do not combine as well with tropical fruits such as pineapple, mango, coconut or orange. --Baked apples is another simple recipe—remove the cores only half-way to the bottom of the fruit. Fill the hole with a combination of cinnamon, sugar, a pinch of cardamom, raisins, walnuts or almonds. Add a small amount of water to the bottom of the pan, and bake at 200 c for 15 minutes. --Salads: Apple chunks go well in recipes with with beets, carrot, walnuts, and light balsamic vinaigrette. --Chip substitute: Apple slices are a surprisingly pleasant chip substitute, on par with carrot slices and cucumbers. Serve alongside dips such as hummus and baba ghanoush. The crisp sweetness in pink apples makes them an especially delicious choice. 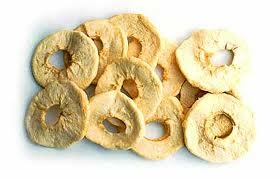 --Some companies sell baked apple chips, a product made by slow-baking sliced apple rings. --Apples hold up beautifully well when cooked, making them ideal for apple pie, muffins, cakes, cupcakes, and tarts. --Make apple sauce by placing 8 peeled and chopped apples in a saucepan with a cup and a half of water. Cover the saucepan and place on medium heat, letting the apples soften over the course of 20 minutes. Once cooled, mash the fruits and stir in nutmeg, cinnamon and sugar into the newly formed apple sauce. --During the fall and winter, many European and American households make spiced apple cider, a beverage that pairs well with spiced alcohols and rich syrupy ports. --Caramel apples are another seasonal treat, specifically during the fall months. These are made by making a rich caramel syrup, rolling a whole apple in the concoction, removing, and then sprinkling nuts or drizzling chocolate sauce on the fruit. Apples are related to roses. As of 1890, the apple is Britain’s national fruit. On any given apple tree, the fruits closest to the trunk are less ripe than the fruits hanging on the outer branches. thank you so much for this detailed information on apples in india . it really helped me with my school assignment .